Precious metals merger mania… the conference where deals get done in the ladies’ room… ongoing civil war mailbag feedback… and more! On New Year’s Eve, President Trump signed the BOLD Infrastructure for Alzheimer’s Act. The measure is primarily a public health initiative to combat Alzheimer’s disease and dementia, allocating up to $100 million over five years to the effort. The requirement might be a stretch for state budgets, but states can plead hardship. The secretary of Health and Human Services — Alex Azar — can waive the state requirement. In fact, “[the BOLD Act] gives enormous discretion to the secretary of Health and Human Services to decide which programs get the money,” Forbes says. Alzheimer’s advocates worry the money won’t go to patients and caregivers — but instead be diverted to drug research. “It isn’t for lack of trying that we don’t have new drugs to treat this disease. It’s just that over 96% of attempts at developing a new therapy have failed,” our science-and-wealth maven Ray Blanco says bluntly. Yes, there’s a handful of drugs approved to treat it. Alas, none does more than mask the symptoms. Worse, as we documented a couple of years ago, the death rate from Alzheimer’s keeps climbing — up 55% from 1999–2014. Science has made steady progress with heart disease and cancer; cancer deaths have dropped 27% in a generation. In contrast, science has been running a losing race against Alzheimer’s. Reverse that process and Alzheimer’s becomes completely treatable. TREM2 repair is a totally different approach from the one researchers have taken for the last generation. They’ve been targeting “amyloid plaque” in the brain — on the assumption it contributes to Alzheimer’s in the same way plaque clogs up your arteries. The result of this approach is that 96% failure rate at developing a new therapy. TREM2 repair has the potential to change everything we’ve thought about Alzheimer’s. Ray says it could also make a niche group of investors extremely wealthy — as in a three-day stock gain of 35,168%. That’s a big number, for sure. But Ray lays out the research behind it when you follow this link. There’s no long video to watch, but you don’t want to put off reading his special report: For reasons Ray explains when you click, this link will go dead in less than 12 hours. … “concerns about poor earnings,” says CNBC. At last check the Dow is down half a percent; ditto for the S&P 500. The Nasdaq is down about three-quarters of a percent. Earnings season “officially” starts tomorrow when JPMorgan Chase — one of the 30 Dow “industrial” stocks — reports its numbers. But another megabank got a jump on the season this morning. Citigroup’s revenue disappointed mightily… but it squeezed out expectation-beating profits thanks to cost-cutting. C shares are up 3.5% as we write. If the other big banks can deliver similar results this week, earnings season should be mighty strong. Often as not, the performance of financial stocks leads the rest of the market. So let’s tackle those “concerns about poor earnings” head-on… because the word “poor” is doing some heavy lifting there. “Poor” relative to what? For the earnings season starting tomorrow, the market number-crunchers at FactSet anticipate the typical S&P 500 company will deliver profit growth of 10.6% compared with a year earlier. “If 10.6% is the actual growth rate for the quarter, it will mark the fifth straight quarter of double-digit earnings growth for the index,” says FactSet’s John Butters. Sounds great, right? But here’s the problem: Most of the glow from the corporate tax cut last year is wearing off. It wasn’t hard to deliver year-over-year profit growth of 20% or better under those circumstances. By comparison, 10.6% is a buzzkill. So your typical web surfer with an interest in the markets sees CNBC’s headline about “poor earnings” and draws unwarranted conclusions. Gold is steady at $1,290… but the buzz in precious metals this morning is all about a mega-merger. Newmont Mining will acquire Goldcorp for $10 billion. Newmont will once again leapfrog Barrick Gold as the world’s leading producer; Barrick did its own acquisition last fall — picking up Randgold. As is frequently the case, traders like the deal for the acquisition target much more than they do for the acquirer. GG shares are up 7% at last check, while NEM is down 9%. For GDX, the big gold-miner ETF, the result is a wash; GDX is down 1% on the day. It’s still boom times in San Francisco and in the health care sector — so much so that meetings are taking place in the ladies’ room. The 37th annual JPMorgan Healthcare Conference is now over. As we mentioned while it got underway last week, times are so good that one of the conference hotels was charging companies hosting an event $170 for a gallon of coffee — or $21.25 for a 16-ounce cup. Meeting space was hard to come by for the 10,000-plus attendees. So hard that one restaurant was charging $300 an hour for access to a bare wooden table, according to Bloomberg reporter Kristen V. Brown. “… it seems some type of collision course is down the road possibly sooner than later. Many of our young people of the last two generations fail to appreciate our freedoms, nation’s heritage or capitalism. The radical left and liberal media edge on the anger by their followers against the conservatives, Trump, etc. And then there is the distrust of big banks, government-tied tech giants, etc. “I wonder if we are in such a great divide that we are seeing a type of Bolshevik or French Revolution. “Really appreciate the thoughtful introspection and comments regarding the new American civil war. “No fake news or repeated talking points here. Just intelligent perspectives and diversity of thought. Voices of reason and logic. Voices that are enlightening us. Love it. Voices that can break through the psychological wall they have built. The wall that was built to divide the very country they took an oath to protect and defend. The invisible wall that was created by political correctness and identity politics. Yes, I agree with the writer who said that is exactly what they want. To play into their hands. American civil war. “Look at France. Is there going to be another French Revolution? There is more there than meets the eye. However, the writing is on the wall as far as America is concerned. Many can already read their script and are preparing as they see fit. “Keep speaking. More speech frees suppression of speech. Reason and logic must prevail. The 5: Well, thank you. Ever since I broached this subject briefly after Charlottesville in 2017… one thing has nagged at me: What would be the single defining issue of this looming conflict? In the American Revolution — which the scholar Michael Vlahos says was America’s first civil war — the core issue was independence from Britain. Simple. Understandable. Put it on a postcard. What’s the core issue now? That’s the irritating thing about Donald Trump’s outsized personality: Everybody on “both sides,” whatever that is, wants to make it about him. Strip him out of it and what’s left? What’s the core issue the two opposing sides are coalescing around? It’s still fuzzy to me. Anyway, we’re sure to return to the subject sooner or later. P.S. A world without Alzheimer’s — too bold to contemplate? 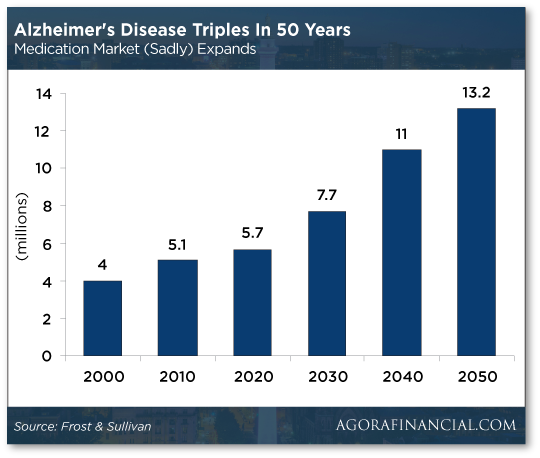 Not for the scientists at a West Coast “startup” who are determined to blow apart 30 years of Alzheimer’s conventional wisdom. Along come these upstarts — who say the real culprit is a strange molecule called a TREM2 protein. And they have a plan to stop it. Now they’re on the verge of announcing it to the world — a world without Alzheimer’s. And hardly anyone will see it coming — except you. But you must act before midnight tonight. Click here — before the stock of this tiny neuro-tech lab goes sky-high.